1) Sign up for a Moz.com account here. 3) Sign in to your Moz.com account on the next screen. 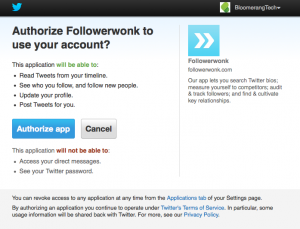 You will be redirected to Followerwonk. 4) Click the orange “Sign In With Twitter” button. Click “Authorize app” on the next screen. The report will run and you’ll be presented with a lot of useful analytics. 6) Scroll down to the “Most active hours for users (account) followers.” You’ll see a 24-hour span bar chart. Below the bar chart, you’ll see that Buffer will suggest a daily quantity of tweets and schedule them based on your most active hours of the day. If you aren’t familiar with Buffer App, think of it as a smart tweet scheduler. 7) Click the orange “Schedule at Buffer” button to set your Buffer schedule based on the results of the Followerwonk report. You will be prompted with a notification. As your Twitter community grows and changes, it’s recommended that you revisit this schedule from time-to-time. Your optimum tweet times may change!